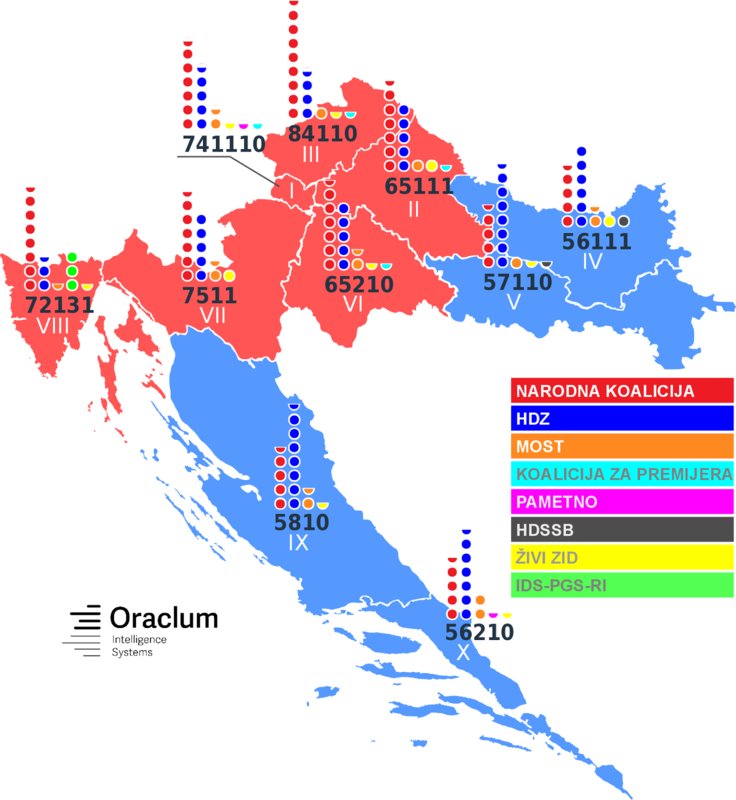 This week my colleagues and I from Oraclum were focused on predicting the outcome of the forthcoming Croatian general election. We did the same thing last year and were not expecting to do Croatian elections again, at least until the local elections in 2017. However, the new government - formed after almost 2 months of post-election negotiations - survived in office for only 6 months. Last year there was no relative winner as the two main coalitions, led by the conservative HDZ and the social-democrat SDP both came tied with 56 seats (76 needed to form government). The biggest surprise was a centrist party MOST which grabbed 19 seats making it the kingmaker party, with a number of smaller parties entering Parliament as well. The new election is to be held this Sunday, and so we ran our unique BASON Survey (Bayesian Adjusted Social Network Survey) over the past week to feel the vibe of the voters and make our election prediction. A little bit about the survey before we share its results. The BASON Survey is an experimental polling method with an aim to give a precise prediction of elections without worrying about the representativness of our sample. It rests upon our newly-designed Facebook survey, where we use a variety of Bayesian updating methodologies to filter out internal biases in order to offer the most precise prediction. In essence we ask our participants to express their preference of who they will vote for, and more importantly, how much do they think their preferred choice will get (in percentages). Depending on how well they estimate the prediction possibilities of their preferred choices we formulate their predictive power and give higher weight to the better predictors. (We used the same thing for the Brexit referendum, see here). The final results of our BASON survey predict a close relative victory of the People's Coalition (Narodna koalicija) led by SDP with 59 to 61 seats, just above HDZ with 52 to 54 seats. MOST would remain the third biggest party with a predicted 12 to 14 seats, while the biggest surprise of the election could be the anti-establishment Živi zid (Human blockage) with a potential of up to 8 seats (last time they had a single seat). Koalicija za premijera led by the Mayor of Zagreb Milan Bandić is estimated to get between 1 and 3 seats, while the new party Pametno (Smart) is estimated to get up to 2 seats. The two regional parties will remain within their usual seat allocations: IDS is predicted to get 3 seats, and HDSSB between 1 and 2 seats. The general conclusion is that the result will be similar to the one from last year’s elections, with two important differences: the SDP-led coalition will get the largest number of seats (although still about 16 seats short of a majority), and last year’s big surprise MOST will cease to be the only kingmaker party – they will be joined by the anti-establishment Živi zid. This suggests another long round of negotiations to form a government. Furthermore, it is interesting to note the divergence of MOST’s political capital compared to the last election where they received a whopping 19 seats. We are again likely to get around 20 seats from voters positioning themselves against the establishment SDP and HDZ (not counting the regional parties), but this time in slightly different ratios. Živi zid will, according to our results, manage to take about 5 to 8 seats from MOST which came out bruised from their short-lived coalition with HDZ. However, a clear-cut conclusion as to who took the votes from whom is beyond the scope of our method. The novelty of this survey is the inclusion of so-called marginal seats (seats that can go to two or more parties at a given district - shown as half a circle in the map above). 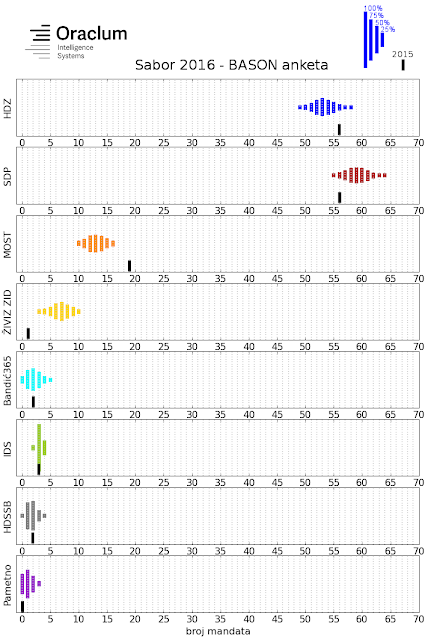 The following figure shows the probability distributions for each party in terms of total seats it could get. The People's coalition has a probability of gaining between 55 and 64 seats, with the greatest probability between 59 and 61 seats. HDZ could get between 49 and 58, with the greatest probability between 52 and 54. The seats for MOST vary between 10 and 16, with the greatest chance between 12 and 14. Živi zid could get between 3 and 10, but most likely between 5 and 8. 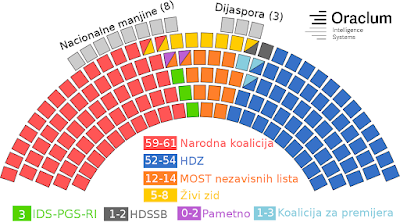 The coalition behind Milan Bandić could get anything between 0 and 5 seats, with 1 to 3 the most likely. Pametno could get anything between 0 and 3 seats, IDS is almost certain to get 3 seats, while HDSSB has equal chances of getting 1 and 2 seats. 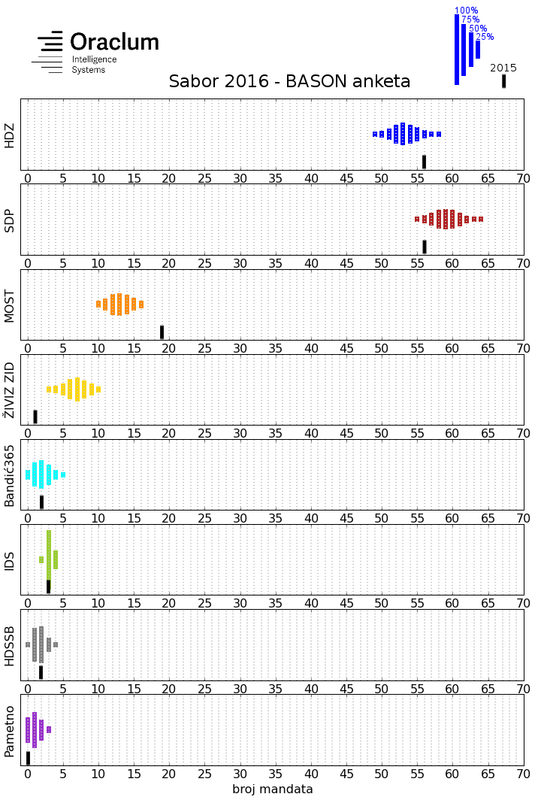 distribution of seats with the widest bar denoting the highest probability. When it comes to the relative precision of our survey, it is interesting to see how it compares to the other surveys done for these elections. We compare it to the surveys done for three national televisions, each done on the level of electoral district, as ours. The following table shows the total number of seats for all three surveys, including ours, however without marginal seats. The considerable differences from all three is that the survey done by IPSOS gives the People's coalition slightly less that the other three, while it simultaneously overestimates the chances of the Bandić coalition, which according to all three surveys vary from 0 to 7. The potential number of seats for MOST and HDZ are more or less equally predicted across all surveys. So are the chances of Živi zid which is estimated to be the biggest surprise of the election, even though they have a marginal seat in almost every electoral district, meaning they could easily under-perform as well as over-perform. In conclusion, it is interesting to note that the results of our online survey are similar to the ones done by traditional surveys, despite a non-representative sample and a very biased pool of participants. This kind of a novel predictive online survey is therefore robust to the biggest problem of surveys in general - assembling a representative sample. In further iterations we will test the survey again on other elections (first on the forthcoming US elections in November) whilst improving its methodology.